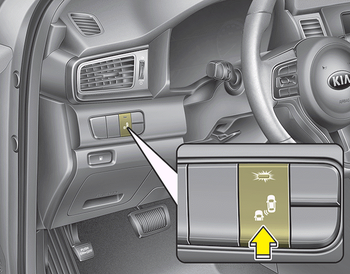 The indicator on the switch will illuminate when the Blind spot detection system switch is pressed with the ignition switch ON. If the vehicle speed exceeds 30 km/h (18.6 mph), the system will activate. If you press the switch again, the switch indicator and system will be turned off. If the ignition switch is turned OFF and ON the system returns to the previous state. When the system is not used turn the system off by pressing the switch. When the system is turned on the warning light will illuminate for 3 seconds on the outside rearview mirror.